Cute story about a "fantabulous" pair of friends who attend a prestigious theater summer camp. Demi is a gay, black young man who doesn't feel accepted at home. Sadye is a straight, white young woman who doesn't know if she has what it takes to be a STAR. The story was a fun romp through the uber-competitive, touchy-feely world of theater wannabees. The theater culture references will date this book (i.e. calling something Kristinish after Kristin Chenoweth from Wicked) and the characters were often predictable. Nice book to have on the shelves, but NAY for Thumb's Up. I've enjoyed Lockhart's previous books, and found this one to be equally humorous and dramatic. This story also had a little more meat. The age old story of "where will I fit in." I'm going to give it a yea for now. 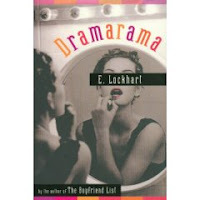 There were aspects that most teens could relate to - friendships changing, competition, identity/finding your place, etc. but I feel that a teen who doesn't know anything about musicals/dramas might feel lost - NAY for me. Nay for me. Four summers at an arts camp lets me relate to some extent, but I see this dating itself pretty quickly.